Raleigh, N.C. – North Carolina House Speaker Tim Moore (R-Cleveland) and Senate Leader Phil Berger (R-Rockingham) on Tuesday affirmed legislative Republicans’ commitment to providing North Carolina public school teachers a fifth consecutive pay raise as part of the legislative short session slated to begin on Wednesday, May 16. Moore and Berger said teachers should expect to see an average 6.2 percent pay raise in the 2018-19 school year alone. Under the current 2017-19 state budget, teachers are scheduled to receive an average $4,412 raise, after lawmakers overrode Gov. Roy Cooper’s veto last year. And unlike a recent proposal from the governor, lawmakers will pay for the raises without a tax hike. The leaders also unveiled a transparent new tool at www.ncteacherraise.com designed to help teachers, parents and the public understand the total increase to base teacher pay since 2014 under Republican leadership. According to the General Assembly’s nonpartisan Fiscal Research Division, the average teacher salary for the 2018-19 school year will be roughly $53,600. That’s an average $8,600 – or 19 percent – pay raise compared to the 2013-14 school year. 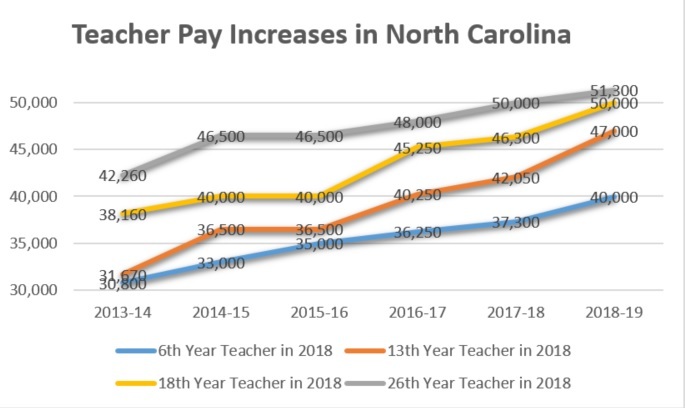 At www.ncteacherraise.com, teachers can view the increase to their individual base pay over the same period by entering their current number of years in the classroom. The base pay figures do not include any benefits, state or local supplements or bonuses. “After taking over from Democratic leadership that furloughed teachers and froze their salaries, Republicans in the General Assembly made a promise to dramatically raise teacher pay in North Carolina – and we’ve kept our promise,” said Berger and Moore. The substantial increases also add up to far higher lifetime earnings. Under the pay plan put in place by Republicans, a teacher will earn $233,000 more in base pay alone over a 30-year career than he or she would have earned under the Democrats’ old plan. The average teacher pay raise from 2017-19 will be $4,412, a 9.5 percent increase. The average teacher pay raise from 2014-2019 will be $8,600, a 19.1 percent increase. North Carolina ranked #1 in the U.S. for fastest rising teacher pay in 2017 according to the National Education Association. North Carolina ranked #2 in the U.S. for fastest rising teacher pay in 2018 according to the National Education Association. A teacher with five years of experience will earn $9,200 more in 2018-19 than the same teacher in 2013-14, from $30,800 to $40,000, a 29.9 percent increase. A teacher with twelve years of experience will earn $15,330 more in 2018-19 than that teacher did in 2013-14, from $31,670 to $47,000, a 48 percent increase. A teacher with sixteen years of experience will earn $11,840 more in 2018-19 than the same teacher did in 2013-14, from $38,160 to $50,000, a 31 percent increase. A teacher with twenty-five years of experience will earn $9,040 more in 2018-19 than they did in 2013-14, from $42,260 to $51,300, a 21.4 percent increase.